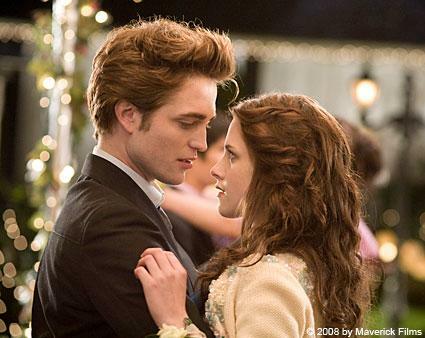 For gals hoping to capture some Twilight romance, recreating Bella Swan's prom hair will ensure you look just as gorgeous as the best-selling vampire-romance novel heroine, with or without Edward Cullen as your date. Duplicate Bella's hairstyle for a look that allows your natural beauty to shine through while still looking sophisticated. If Bella had worn her hair in an intricate updo, she would've been stepping out of character. Instead, she went for an understated half updo that was right in line with the rest of her no-fuss looks. Some loose curls and a few bobby pins that blended in with the color of her hair were all it took to achieve her prom hairstyle. Because it's such a simple look, it will be easy to do at home before a date or the prom. Also, because it's such an understated style, you can wear it any day of the week. To achieve this style, you'll need long hair for the best results. Girls with medium length strands can achieve a similar look as long as the layers in front aren't too short. Bella doesn't have bangs, but if you do, just style them as usual and complete the rest of the look. Layers like Bella's also help give the hair a flowing, carefree appearance, but again, there's no need to cut them unless you just want to. The style is perfectly achievable with long hair that's all one length. If your hair is on the thin side or doesn't have a lot of natural body, apply a thickening or volumizing mousse after you wash it, then blow-dry with warm (not hot) air. You may wish to wash your hair the day or night before your date since hair tends to hold curl and updo styles better when it's a little dirty. Hold the curling iron vertically and wrap the hair around it, being careful not to burn your fingers as you wrap the ends into place. Alternate the direction of the curls. Curl some toward the face and others away from the face. Once you've removed the curling iron from the section of hair, pin it into place with a bobby pin until it cools. Another option is to use hot rollers instead of a curling iron. Mist the curls lightly with flexible hold hairspray before releasing them, then run your fingers through them to break them up and turn them into looser curls that border on waves. Grab a one-or-two-inch section of hair and twist it over once or twice as you pull it behind the ear. Pin it into place with a bobby pin that matches your hair color, then lock that pin into place with another one crossed over in an X pattern. Repeat one to two times per side. Though this style is easy, if you don't have very much experience wielding a curling iron or hot rollers, practice a few times in advance. You'll find out which products work best for you, how much you can run your fingers through your curls before they turn frizzy and almost-straight rather than wavy, and how long the curls will last. (You may need another spritz or two of hairspray before the big night.) You will also be more confident in your hairstyling abilities on the big day, when you may already be nervous about your date.